GossHawk in Attendance at the 2013 Copperstate Fly-In | GossHawk Unlimited, Inc.
GossHawk was a participant in this year’s Copperstate Fly-In! 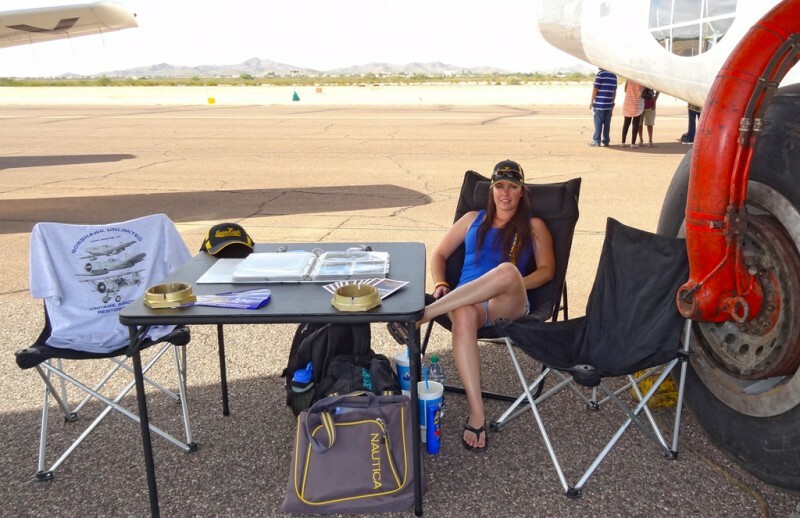 With the fly-in being right in our “backyard”, Lindsey Goss attended all three days of the Copperstate fun! Dave was able to join the party on Saturday due to GossHawk being closed on weekends. This was not only a great marketing opportunity for Lindsey, but it gave Dave and Lindsey a chance to meet up with old friends whom they had not seen in years! In September, an engine vibration analysis on the PB4Y-2 Privateer revealed a problem with the propeller on the #4 engine. The prop was removed and sent out for inspection and overhaul. Although the PB4Y-2 was unable to fly, we towed her over to the show so that she could be enjoyed by all! In addition to the Privateer, we also towed a North American T-28 Trojan to the show. This is a T-28A/D model and for sale by owner Dan Kirkland. Copperstate is an annual fly-in, held at the end of October at the Casa Grande Municipal Airport. This event has a little something for everyone! 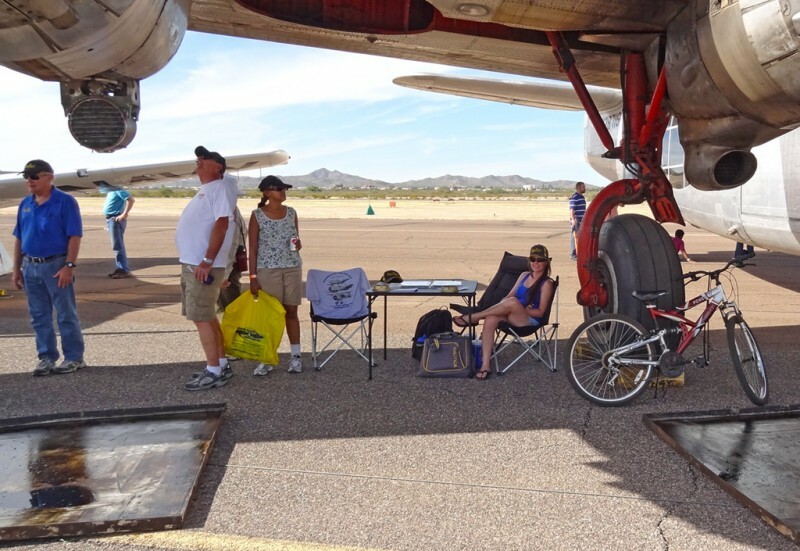 Copperstate attracts a variety of aircraft including general aviation, home builts, ultralights, and a handful of warbirds. In addition to these great planes, Copperstate offers workshops for youth, good food, and many vendors participate in this fly-in. 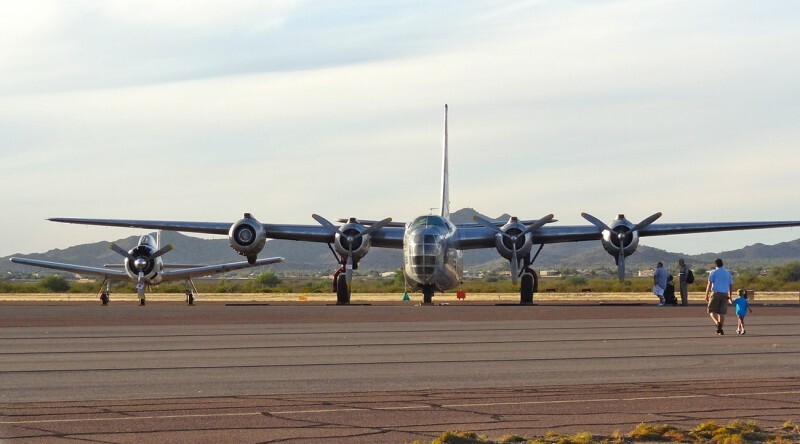 The Consolidated PB4Y-2 Privateer and North American T-28 sit on the ramp at the Copperstate Fly-In. Dave and Lindsey Goss talk with airshow attendees and friends. Lindsey Goss finds a shady spot under the wing for marketing.